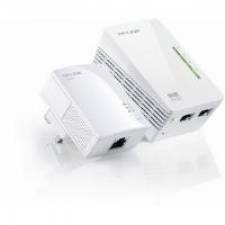 TP-LINK Wireless N Powerline Extender TL-WPA281 extends the Internet connection to every room of the house through power lines. All devices in the room have two options to get access to TL-WPA281 whether through wirless or using Ethernet cable. With 200Mbps powerline link rate and 300Mbps wreless N rate it is ideal for bandwidth consuming or interruption sensitive applications like video streaming online gaming and Internet calls. With TL-WPA281 WLAN is in every room of your house. With advanced HomePlug AV technology, TL-WPA281 Starter Kit provides users with stable, high-speed data transfer rates of up to 300Mbps on a line length of up to 300 meters. Together with its built-in Qos and powerful AES encryption, the TL-WPA281 is a great choice for a whole home solution to connect all network compatible devices--from computers and game consoles to set-top boxes for IPTV to printers and NAS hard drives.